Disponible en Amazon, Dugu lo importa a Chile. Yhkj. ☑●Two charging slots independent design, you can charge ordinary 18650, can also be charged with protection 18650, and 17670 and other lithium batteries. ☑●No memory effect, recharge up to 1000 cycles,durable in low and high temperature operations. ☑●Low discharge rate, higher energy density and lower weight than other types rechargeable batteries. 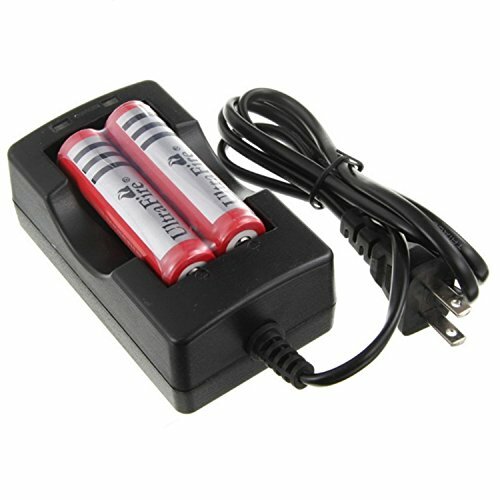 ☑●This Product battery and charger for your 18650 battery for home use essential equipment. ☑●The product reliable quality, stable performance,high safety level .If you are not 100% satisfy with the purchase for any reason, don't hesitate to contact us to request a refund or replacement. Indicator light lets you know when charging is complete. Not for the devcies match the Flat Top 18650 battery like E-cigarette Vape, etc.